Foundation Funds | Sholom - Care. Compassion. Community. You may make a donation to the Sholom Foundation General Fund or to any of the Endowment Funds listed below. Honor family members or friends on their birthday, wedding, anniversary, Bar/Bat Mitzvah or any simcha/special occasion. Wish someone a speedy recovery or express your condolences. All donations are acknowledged with a card sent to the individual or family you are honoring with your contribution. A Sholom Foundation Endowment Fund is a gift that lasts in perpetuity. The principal is invested and income from the fund is allocated annually for the Sholom services, facilities and programs. You may also designate a specific purpose for a fund. If you are interested specifically in supporting Sholom through the Sholom Auxiliary, you may establish a Sholom Foundation Auxiliary Endowment Fund for the express purpose of helping the Auxiliary achieve its mission of enhancing the lives of the residents at the Sholom Homes. An endowment fund may be established starting at $10,000 (cash or pledge) or $20,000 (deferred gift). The fund may be in your name or the name of a loved one. A plaque on the Walls of Honor on the Ackerberg Family Sholom West Campus in Saint Louis Park and the Rossy & Richard Shaller Family Sholom East Campus in St. Paul will honor fund donors. Endowment funds are also listed in each issue of the Sholom Foundation Circle of Life publication and other Sholom publications and media. 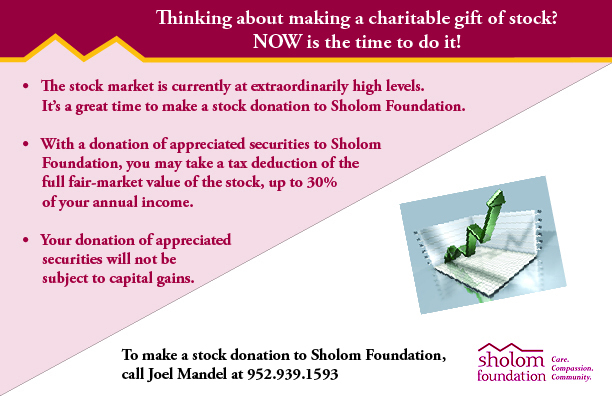 To learn more about establishing a Sholom Foundation endowment fund please call Joel Mandel, Executive Director, at 952.939.1593 or contact us. In addition to establishing a Sholom Foundation Fund, for gifts starting at $25,000, you have the opportunity to name specific areas, rooms, equipment or furnishings in Sholom facilities or specific Sholom programs as well. Joel Mandel, 952.939.1593 can answer all your questions about naming opportunities. All funds will be acknowledged by plaques on the Walls of Honor at the Ackerberg Family Sholom West Campus in St. Louis Park and the Shaller Family Sholom East Campus in St. Paul. *A deferred gift is a bequest or planned gift (charitable annuity, trust, life insurance), that will benefit Sholom following the donor or annuitant's death or a defined period of time. Combinations of cash, pledge, and deferred gifts are welcome. Have you named Sholom Foundation as a beneficiary of your will, IRA or life insurance policy? Or made Sholom Foundation a beneficiary through a charitable gift annuity or charitable trust? If the answer is yes, please call 952.939.1593 or contact us and let us honor and acknowledge you with membership in the Sholom Foundation Heritage Society. Click here to make a donation right now! Mail check to Sholom Foundation, 3610 Phillips Parkway, Minneapolis, MN, 55426 with your personal message and the address of the recipient to whom you wish the gift acknowledged. Unless designated by the donor, the Sholom Foundation Board of Directors will make annual allocations from these endowment funds to where they are most needed. To increase benefits of employees of Knollwood Place and Sholom Home West. For support of cultural & educational enrichment for residents at Sholom facilities on the Saint Paul campus.